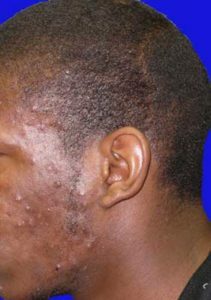 Acne, sometimes referred to as pimples or zits, is a disease of genetic and hormonal nature, afflicting the pilosebaceous apparatus and characterized by the formation of comedones (white and black heads), papules, pustules, and abscesses (cysts). When inflammation is more intense, pustules and abscesses predominate. It is a typical disease of the teenagers with high frequency that affects nearly everyone. Although appearing earlier in girls, usually at 14 years of age, than in boys, at around 16 years, it is the young man who often shows the most severe forms of acne. 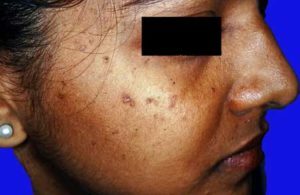 The picture is characterized by skin eruptions in areas with the greatest number of sebaceous glands: face, mainly the forehead, cheeks, and chin, and the superior anterior and posterior regions of the trunk. Acne patients have an increase of keratin production (protein of the skin surface), which leads to the blockage of the pilo-sebaceous opening, interfering with the elimination of sebum. In puberty, there is an increase of sexual hormones that causes increased sebum production. When the amount of sebum is too great for the opening, acne results. Bacteria, such as Propriobacteria acnes, are present, but their exact role has not been delineated. Acne is a chronic problem with periods of exacerbation and regression. Because someone reaches his or her majority, it does not mean acne disappears. In fact, some people have acne well into middle age, even into their seventies. Diet and stress cannot be proven to affect the course of acne, although the acne patient may be distressed by his or her appearance. Acne is also not due to lack or washing, but the condition can be aggravated by the use of moisturizers and other lotions. The treatment of acne involves the use of washes, such as aqua glycolic acid or salicylic acid; antimicrobials to reduce the inflammation, such as doxycycline or minocycline; and keratolytics, such as benzyl peroxide, sulfur-sulfacetamide, or retinoids (vitamin A derived agents). Other agents include birth control pills in women and oral isotretinoin. Scarring today, more often than not, is due to picking. Acne can be treated effectively, but not cured; it takes time for the pimples to disappear.